Halloween has come and gone… and so has It's The Great Pumpkin, Charlie Brown. Now that Turkey Day is soon upon us, why not revisit the special that doesn't get as much attention as its established Halloween and Christmas siblings, A Charlie Brown Thanksgiving. This episode first appeared on CBS back on November 20, 1973 and was the 9th primetime Peanuts special to air. Because its age is older than Christmas and Halloween, most of the voice talents are very different. Linus is voiced by the same person as in You're Not Elected, Charlie Brown, Stephen Shea… who incidentally was the younger brother of the guy who originally voiced Linus in the Christmas episode, Christopher Shea. The episode won an Emmy for Outstanding Individual Achievement in Children's Programming. It's not a very involving storyline. Basically, Peppermint Patty invites herself, Marcie, and Franklin over to Charlie Brown's house for Thanksgiving. Of course, this is a problem, because the Charlie Brown and Sally are heading to his grandmothers for dinner instead! Thus, we have a humorous attempt at pulling off 2 Thanksgiving dinners, complete with Snoopy cooking up toast, jelly beans, and other wonderful delights (as humorously recreated by a passionate fan). One of the under-appreciated elements of this special is the music. 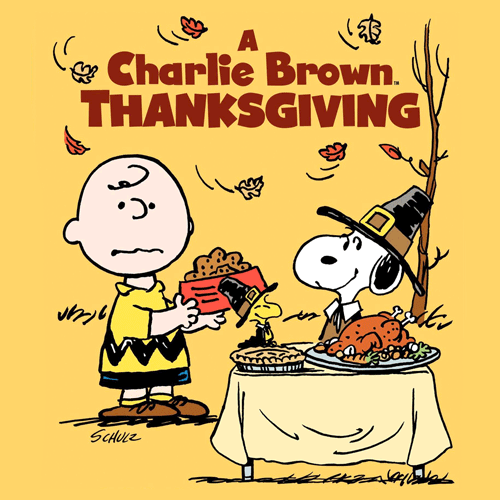 It's still scored by Vince Guaraldi, who added a familiar-yet-unknown "Thanksgiving Theme" to the Peanuts' musical repertoire. He also sings the the lines for another tune, "Little Birdie." Unlike the Halloween and Christmas installments of these classics, Thanksgiving never get a separate kids' read-along or story record album. What gives? How about we just enjoy the audio from this TV special instead? You can listen to it for a limited time. But once that Thanksgiving table is cleared and the Black Friday sales are in full effect, we'll put it in the archive for another year. Enjoy!